It is no surprise how much I adore tomatoes, especially heirlooms. 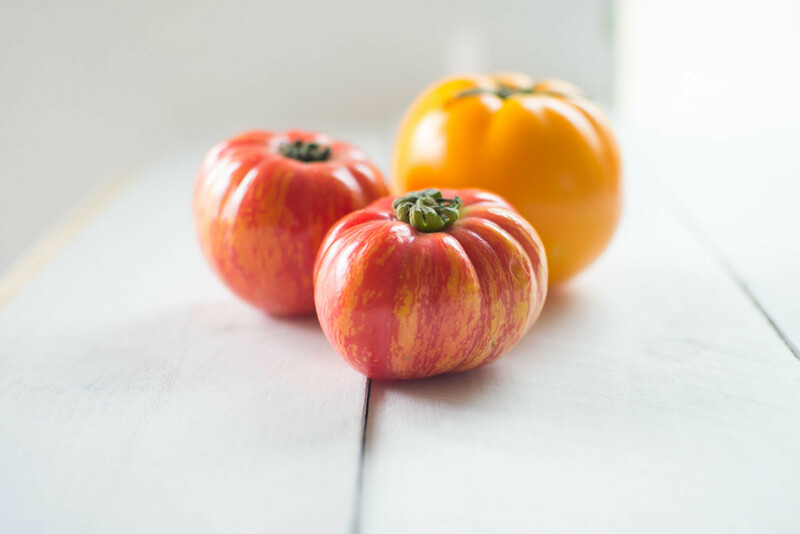 This is my favorite season for food because heirlooms are beginning to peek out, with there fun stripes and crazy shapes. 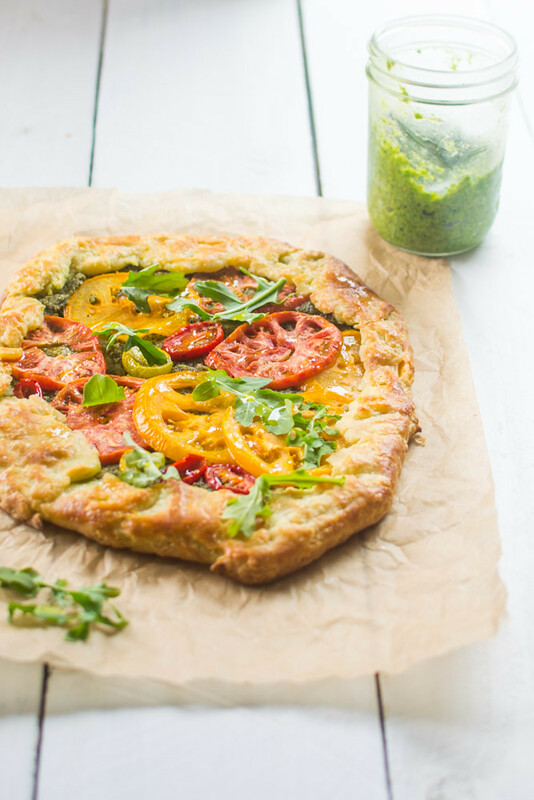 Today I am sharing a simple, gorgeous and rustic heirloom tomato galette. What is a galette exactly? That’s a good question, because I had to Google it too. I was originally going to call it a “tart” but after a quick search, it turns out that galette is just a free form tart. Just in case you were wondering the difference too. I often mull over on what I should make with these beautiful heirlooms. It’s almost like the angel and devil on each shoulder. One saying be bold and trying something crazy and different and the other is saying to leave these beauties as is and don’t cover them up. This is what I stress over every day….crazy, yes? The dough to this recipe couldn’t be simpler! It was inspired from my zucchini galette I made last year which was formerly inspired from Smitten Kitchen. The dough calls for simple ingredients such as flour, butter, cold water and sour cream but instead I added Greek yogurt which made for an incredible savory crust. And the pesto was really made from leftover ingredients I had on hand. 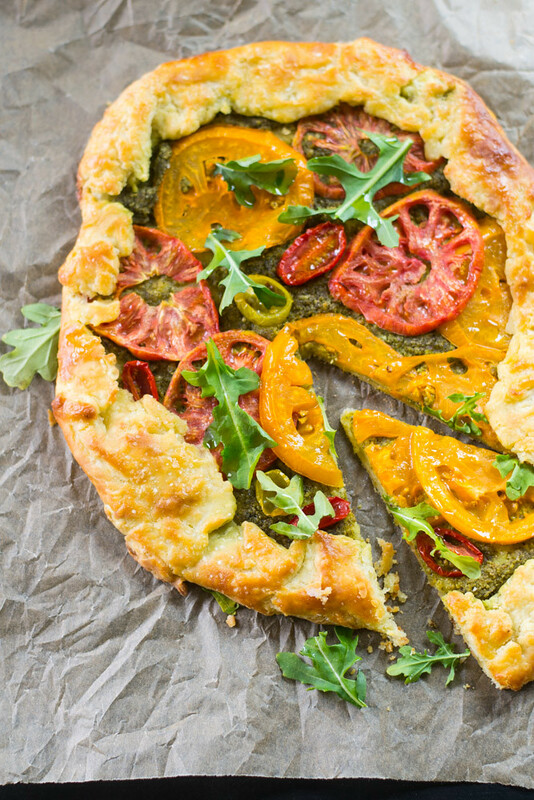 A bag of spicy arugula and hazelnuts blended together and spread all over the galette. I still have a jar leftover and it is FABULOUS dolloped on top of some hummus! (Don’t say I didn’t warn you). 1) First make the arugula pesto. In a food processor add hazelnuts and pulse until finely ground. Then add arugula, grated Parmesan cheese, lemon zest and juice and salt and pepper. Continue to pulse and as the pesto is blending, slowly drizzle in olive oil until desired consistency. When done, taste for seasoning and adjust as needed. Spoon pesto into sealed jar and refrigerate. 2) Next, make the dough. Sift together flour and salt in bowl and add to clean food processor with a dough attachment. Add small cubes of butter and blend together in food processor until it looks like small peas. 3) In another small bowl, whisk together the Greek yogurt, lemon juice and water and add this to flour mixture. Blend together and test by squeezing a small piece of dough with your hands. If it sticks, it’s ready. 4) Using very floured hands, form dough into a disk, wrap in plastic wrap and allow to rest in the fridge for 30 minutes. 5) Meanwhile, slice your tomatoes thin and place them on double lined paper towels. Sprinkle tomatoes with salt and cover with another sheet of paper towel. This will allows the tomatoes to release moisture so your tart won’t get soggy. 6) When dough is ready, roll out on a very very floured surface to about 12 inches in diameter. 7) Once dough is rolled out, transfer it to a non-stick baking sheet. Spread pesto on dough leaving a 1 in border around, then layer tomatoes slices. 8) Fold the border over, creating a pattern if you wish. Brush egg wash around the crust and sprinkle with sea salt. Drizzle the tomatoes with olive oil. 9) Bake galette at 400 degrees F for 20 minutes until the crust is golden brown and tomatoes cooked. 10) Top with extra fresh arugula. This can be served, warm or at room temperature. First make the arugula pesto. In a food processor add hazelnuts and pulse until finely ground. Then add arugula, grated Parmesan cheese, lemon zest and juice and salt and pepper. Continue to pulse and as the pesto is blending, slowly drizzle in olive oil until desired consistency. When done, taste for seasoning and adjust as needed. Spoon pesto into sealed jar and refrigerate. Next, make the dough. Sift together flour and salt in bowl and add to clean food processor with a dough attachment. Add small cubes of butter and blend together in food processor until it looks like small peas. In another small bowl, whisk together the Greek yogurt, lemon juice and water and add this to flour mixture. 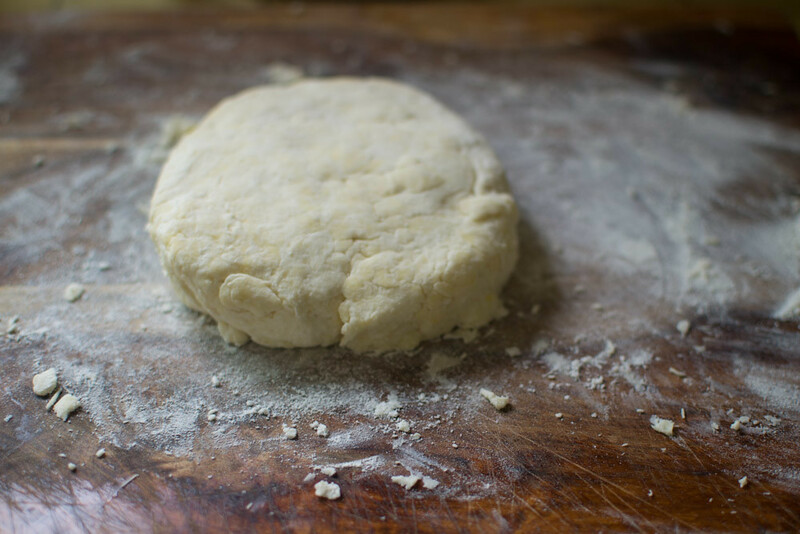 Blend together and test by squeezing a small piece of dough with your hands. If it sticks, it's ready. 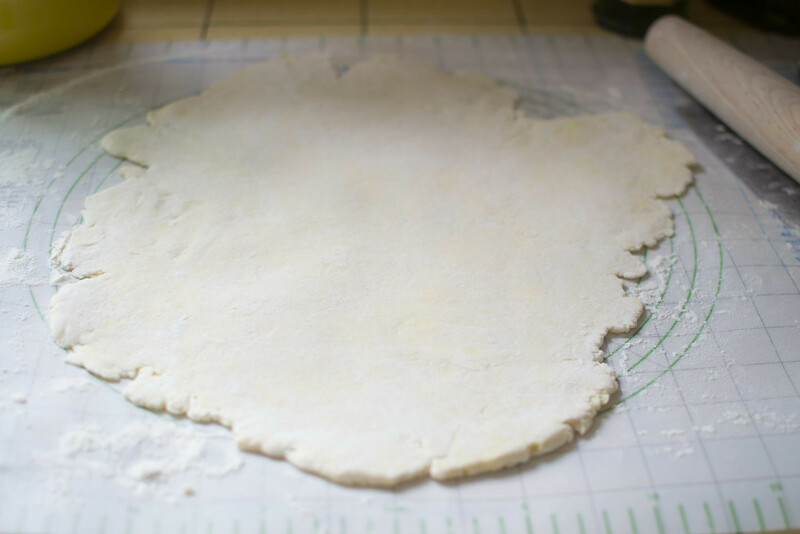 Using very floured hands, form dough into a disk, wrap in plastic wrap and allow to rest in the fridge for 30 minutes. Meanwhile, slice your tomatoes thin and place them on double lined paper towels. Sprinkle tomatoes with salt and cover with another sheet of paper towel. This will allows the tomatoes to release moisture so your tart won't get soggy. When dough is ready, roll out on a very very floured surface to about 12 inches in diameter. Once dough is rolled out, transfer it to a non-stick baking sheet. 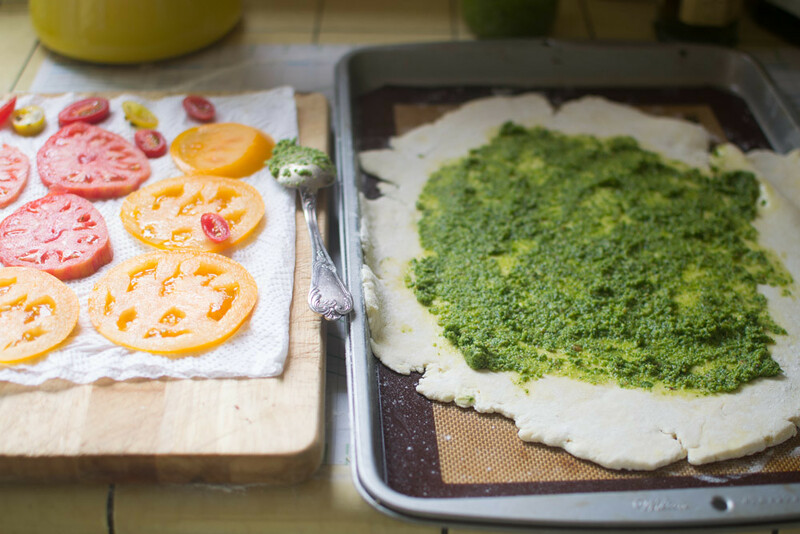 Spread pesto on dough leaving a 1 in border around, then layer tomatoes slices. Fold the border over, creating a pattern if you wish. Brush egg wash around the crust and sprinkle with sea salt. Drizzle the tomatoes with olive oil. 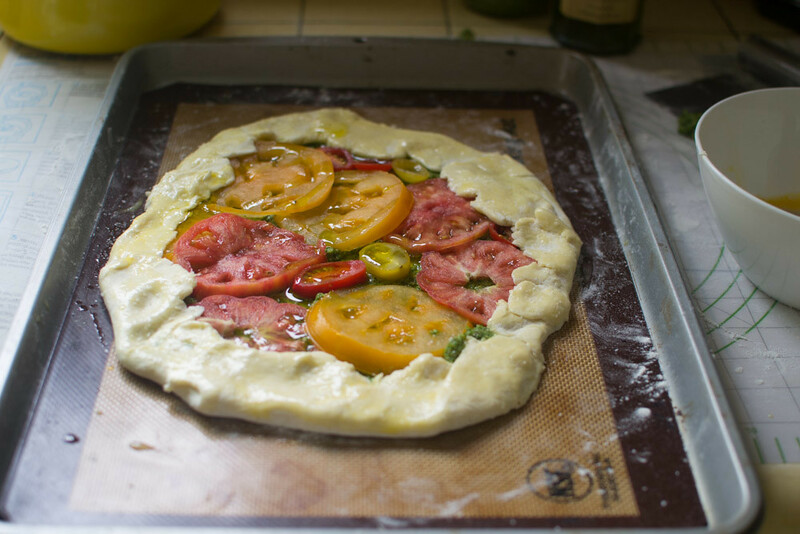 Bake galette at 400 degrees F for 20 minutes until the crust is golden brown and tomatoes cooked. Top with extra fresh arugula. This can be served, warm or at room temperature. The pesto recipes makes enough for 2 cups, so there will be extra. Simply gorgeous! 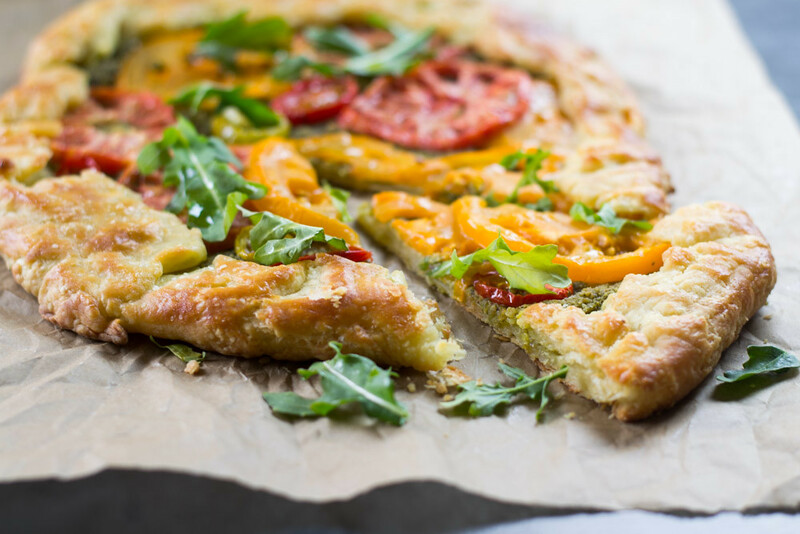 I can see making this soon – and the arugula pesto? Don’t get me started! I love everything about this! I need to get my hands on some heirloom tomatoes. This looks unreal! I love heirlooms maybe almost as much as you! No way…you like heirlooms as much as me?? Perhaps I’ll make it again for your Cali trip!